The band GUILD from Euclid Agency, had a busy 2013 year with a big and successful national tour. During this tour, they have released a digital song per month, to make their fans waiting until their new physical release. In January 2014, they have released the single “Yuuwaku Rhapsody”, like a foretaste of their new full album “Flowers ～The Super Best of Love～”, released in February the 26th. Released on four different versions with different bonus in them, the fans were very pampered by the band, who came back with four new songs included in the album as well as the six digital songs released last year. The album starts with the title song from the single “Yuuwaku Rhapsody” which has an unusual introduction from what we could usually hear from GUILD. The song is dynamic and the melody is catchy, as well as the new song “MASK” which is a bit more ‘rock’ and entertaining, one of my favorite track from the album. The song “Super Look of Love” is also included though it was already included in the album “THE BEST GUILD” in 2012. An unnecessary addition to this album in my opinion. We can also hear the songs from the single “I’ll be there for you”, (“I’ll be there for you”, “DESIRE” and “CIRCUS”). While “I’ll be there for you” is a very beautiful ballad full of emotions, the two others are very dynamic songs, highlighting the high pitched voice of Ryuichi. Same for “CARAVAN” and “Hoshininegaiwo” (Wish upon a star), two entertaining and rhythmic songs. “Cinderella” and “ABC” are for me the best digital songs that they have released last year. The songs have catchy chorus and makes you want to jump around non stop as well as following their cute fandances. The album calms down a little bit with ballads like “Sayonara” as well as “Sakura” which is a rock ballad using some Japanese style sounds, giving an atmosphere well mixed between tradition and mordenism, while “ブックマーク” (bookmark) is slow and calm , with cute piano line. And finally, “居酒屋らぷそでぃー” (Tavern Rhapsody) is for me the biggest surprise of the album, as it has a completely different style of the band is used to give. With samba sounds, the song is really a good track for the season and will warm up your heart and mind. 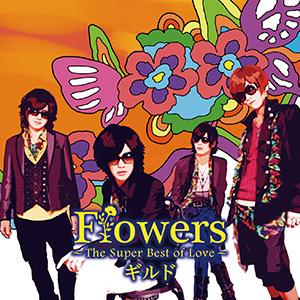 “Flowers ～The Super Best of Love～” by GUILD is a very good album, following their usual style but also adding some modernity and good surprises. They show with this new production, that their success in Japan is not by chance, and that they can go even further. With their engaging, talented and dynamic members, you have no choice but to give them a try.